Claudia Regina Furquim de Andrade5. facial paralysis, electromyography, ultrasonography, masseter muscle, evaluation. Introduction: Individuals with peripheral Facial Paralysis (FP) show conditions that lead to unilateral mastication, performed by the non-affected side, mainly due to the difficulty of action of the buccinator muscle. Objectives: characterize the motor control and morphology of the masseter muscle in individuals with unilateral peripheral FP through electromyographic and ultrasonographic evaluation. Method: 16 participants, of both sexes, with ages superior to 18 years old. The study group (SG) consisted of 8 individuals who'd had idiopathic unilateral peripheral FP for more than 6 months; the control group (CG) consisted of 8 normal individuals. All the subjects were submitted to the masseter muscle evaluation through surface electromyography (sEMG) and ultrasonography (USG) during the following tasks: rest, clenching with cotton roller between the teeth (CT) and clenching with maximum intercuspation (MIC). Results: There was no statistically significant difference in comparisons within and between the groups concerning the hemifacial asymmetry, both for the sEMG and for the USG. Also there were no significant differences in the activation of the masticatory muscles (masseter and temporal) in the sEMG. Conclusions: Both the motor control and the morphology of the masseter muscles in individuals with unilateral peripheral FP were similar to those of normal individuals. Although literature suggests that the demand of functional adaptations made by FP individuals could exceed the structural and functional tolerance of the temporomandibular joints, the results indicate that the length of analyzed patient's FP was not enough to generate anatomical and physiological differences in the masticatory muscles. Facial paralysis is referred to as an interruption of the motor information to the facial muscles. Bell Palsy is characterized as a idiopathic peripheral facial paralysis, usually unilateral and of sudden onset, through an acutely involvement of the facial nerve (VII cranial pair) (1). The paralysis of the facial muscles causes functional and aesthetic disturbs, besides generating social, psychological and/or professional difficulties (2, 3). The lack of movement and expression in one side of the face, as well as changes in speech and eating, constitutes one of the most evident alterations (4). Individuals with peripheral facial paralysis potentially have conditions that induce to unilateral mastication, realized by the non-affected side, especially because of the difficulty of action of the buccinator muscle, once the little involvement of this muscle results in the accumulation of waste in the region of oral vestibule on the affected side (3). During unilateral mastication, the masticatory muscles, especially the masseter, temporal and buccinators muscles, present higher functionality on the side where the mastication is occurring. The musculature of the contralateral side is, as a rule, more elongated and with reduced functional tone, and there may even be a visually perceptible muscle asymmetry (3, 5). Earlier studies (6) found statistically significant difference in the amplitude of mouth opening, left laterality and protrusive between patients with Bell Palsy and normal individuals. Based on this results, it is suggested that the demand of functional adaptations in patients with Bell's Facial Paralysis may exceed the structural and functional tolerance of the Temporomandibular Joints (TMJs), favoring the development of signs consistent with the condition of temporomandibular joint disorder. The Surface Electromyography (sEMG) has been used for researches related to the evaluation of the masticatory function, as a valid method for the assessment of masticatory muscles, which can be correlated to masticatory efficiency (7, 8). The sEMG is a non-invasive, pain free exam, that allows the study of the muscular activity, enabling the capture of action potentials generated during the muscular contraction, which can be analyzed considering the parameters of length and amplitude (3, 4, 9, 10). The Ultrasonography presents considerable advantages over other types of image evaluations, such as digitalized tomography exams and magnetic resonance imaging, what makes it the most appropriate method for large-scale studies. Compared to digitalized tomography, the Ultrasonography does not present the known cumulative biological effects. It is a simple and inexpensive method to measure the thickness of the muscles, as long as the radiologist follows a specific protocol (11, 12). The Ultrasonography, used aiming to measure the muscular slices, can relate to some pathologies and the muscular strength, besides other parameters related to functionality and age (13-16). 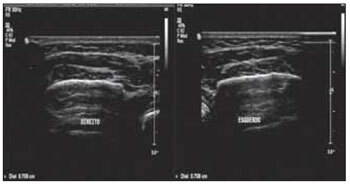 But the significance of Ultrasonography as reproducible technique in the assessment of the masseter muscle is still uncertain and the reliability indices found in the literature are quite variable (17). In order to verify the functional implications of facial paralysis in the biomechanics of the TMJs, this study aimed to characterize the motor control and morphology of the masseter muscles in individuals with unilateral peripheral facial paralysis, through surface electromyographic and ultrasonographic evaluation. Sixteen individuals took part in this study, of both sexes, with ages above 18 years old. The study group (SG) was formed by 8 individuals with unilateral peripheral facial paralysis, 4 males and 4 females (average age of 37,8 years); and the control group (CG) consisted of 8 healthy individuals paired by gender and age to the SG (average age of 35,9 years). The process of selection and evaluation of the participants began only after the relevant ethical procedures: opinion of the ethics committee (CAPPesq HCFMUSP no 0686/09 - 24/02/2010) and signing of the Term of Free and Clear Consent. a. Diagnosis of FP registered in medical record, of peripheral origin, idiopathic, without surgical reconstruction or rehabilitation of the facial nerve. b. Facial paralysis for more than six months. c. No history of facial trauma and/or surgery on facial or neck region. d. Absence of use of dental prosthesis, partial or total. e. Absence of previous speech therapy. f. Score from four to eleven at the Protocol of Clinic Evaluation of the Facial Muscles of the Paralyzed Side (18). a. Complaint or medical diagnosis of facial paralysis. b. Alterations on the Stomatognathic System and in the region of the shoulder girdle. c. Alteration on the permanent dentition (absence/extraction of the 3rd molars may be accepted) and change in the facial pardon. d. Use of orthodontic apparatus. f. History of facial trauma and/or surgery on facial or neck region. g. Use of dental prosthesis, partial or total. h. Score of 19 or 20 at the Protocol of Clinic Evaluation of the Facial Muscles (18). For the electromyography the equipment used was the Miotool 400 (Miotec Biomedical Equipments) with 4 channels, calibrated in 500 microvolts (¼V) with filter of the band-pass type (20-500 Hz) and gain of 100 times, with low level of noise (< 5µV RMS) considered by the International Society of Electrophysiology and Kinesiology - ISEK (1999) (19) as recommendable. The software used to capture and process the surface electromyography exam was the Miograph 2.0 applicative from the same manufacturer, which performs the acquisition, storage and online processing of signals carried under the Windows XP operational system. The signals of electric activity of muscular movements were captures by bipolar electrodes with Ag/AgCl surface, disposable, SDS500, fixed with transpore tape (3M). The positioning of the electrodes obeyed the technique of placing the midpoint of the muscle belly in the longitudinal direction of the muscle beam in the mesodistal position of the muscle suggested by previous study (20) where is observed a wider range of signal for this type of electrode. To guarantee the correct placement of the electrodes, initially, a previous identification of the muscles was made by palpation during rest and maximum contraction - a maximum dental intercuspation was requested. After this stage, the muscular function was tested for verification of possible processing errors and performed new placement of the electrode, if necessary. -Clenching with maximum intercuspation (MIC). For the data collection, the participants were comfortably seated in a chair, with the back supported, feet on the floor, hands resting on the lower limbs, head properly positioned (Frankfurt Plane parallel to the floor), eyes opened and seeking a pre-determined fixed spot. The skin of the face was cleaned using gauze soaked with 70% alcohol to remove the skin oils, favoring the impedance. The captured signals were analyzed iin RMS and expressed in microvolts (¼V). The reference cable (ground wire) was connected to the electrode fixed on the wrist, for being a distant and neutral region in relation to the analyzed muscles. Firstly was performed a collection of the muscles during rest, for 30 seconds. Three collections were made and obtained the average of the electric activity of these muscles at rest. Afterward, the participant was asked to remain at rest for 15 seconds, without record. After that command, a 10mm cotton roller was placed between the first and second molars bilaterally, and the participant was instructed to bite with maximum possible strength for 5 seconds, three times in a row, with 5 seconds interval between them. Three collections were made from this test and obtained the average of electric activity at the maximum clenching with cotton roller (total of nine samples of electric activity of each muscle). The same procedure was performed to obtain the record of the electric activity of the masseter muscles during maximum intercuspation. The electromyographic signals were registered and analyzed posteriorly. The electromyographic tracings were obtained in raw signal (RAW) and analyzed in rectified signal (RMS). For the sEMG result analysis was used the temporal domain analysis. In this case, the information obtained describes in which moment the event occurred and the range (indicator of the magnitude of muscular activity) of its occurrence. In the rest situation, the values found represented the average (RMS) of the electromyographic activity observed in 30 seconds. The length of the muscular activity during the tasks of clenching (CT and MIC) was obtained by selecting the section representative of the muscular activation (situations on, peak and off). This section was selected with the electromyography program's own cursor and converted in µV (Figure 1). Based on related literature, which points subjectivity in reading of measurements of sEMG, was carried a reliability analysis in order to determine the level of agreement between the examiners and thereby ensure greater reliability of the measures. For this, 14 electromyographic samples were randomly chosen out of a total of 144. These samples were analyzed, independently, by two independent and experienced researchers. The correlation coefficient was found to be high for all comparisons (confidence interval 95% [CI] = 0.9245-0.9567), indicating high consistency between the examiners. The assessment of the thickness of the masseter muscle was made using the methodology proposed by previous study (14). All images were made by the same radiologist using the Philips L12-5/MSK Gen equipment. While obtaining the images, the transducer was positioned perpendicular to the surface of the skin, avoiding excessive pressure. The measurements were obtained in the most voluminous portion of the masseter, close to the occlusal plane, approximately at the center of the mediolateral distance of the branch region. Images and measurements were taken bilaterally with the individuals in supine position in three different conditions: at rest (usual position) (Figure 2); in maximum intercuspation with 10mm cotton roller between the dental arcades in the region of first and second molars (Figure 3); and in maximum intercuspation without cotton rollers (Figure 4). The measurements were taken at the moment of the image collecting in real time. The images and measurements were performed three times, with an interval of five minutes between each measurement. For multiple comparisons was used the Wilcoxon Matched pairs test, with 5% significance level. The results are presented in Tables 1, 2 and 3. 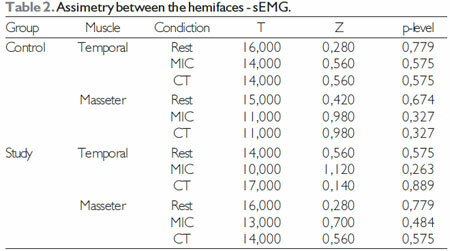 According to the observed in Tables 1, 2 and 3, there was no statistically significant difference in intragroup comparisons in all cases tested, that is, both groups did not show differences between the hemifaces concerning the range of electromyographig signal and muscular thickness in any of the tested tasks. Besides, no statistical difference was observed for the electromyographic amplitude for the masticatory muscles (temporal x masseter) for both groups. For the comparison between groups Na was used the Mann-Whitney test with 5% significance level. In this analysis were compared the levels of facial asymmetry of both groups (SG - paralyzed side/non paralyzed side; CG - right side/left side) for the results of masseter and temporal muscle in sEMG and of masseter muscle in USG (Tables 4 and 5). As noted in Tables 4 and 5, there was no statistically significant difference in comparisons between groups in any of the tested situations, that is, the asymmetry levels between hemifaces was similar for both groups. Figure 1. Electromyographic Activity in RMS of the temporal and masseter muscles in maximum dental intercuspation with cotton rollers. Figura 2. 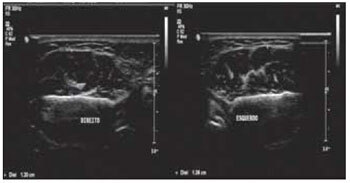 Ultrasonographic Image of the left and right masseter muscles at rest. Figura 3. Ultrasonographic Image of the left and right masseter muscles in maximum dental intercuspation with cotton rollers. Figura 4. 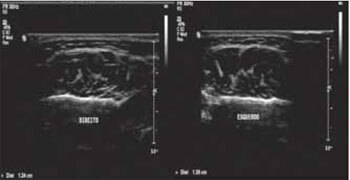 Ultrasonographic Image of the left and right masseter muscles in maximum dental intercuspation. The study results show that the motor control and morphology of the masseter muscles in individuals with unilateral peripheral facial paralysis are similar to those of normal individuals. The characterization of the motor control of masseter and temporal muscles, assessed through sEMG Exam, showed no statistically significant difference between the groups, meaning there is no distinction between them. It is found in literature that the sEGM may be influenced by the thickness of the fat layer under the skin, the positioning of the electrodes and the patient's motivation in taking the exam (10). Previous studies also discussed the difficulty to determine, through USG exam, whether the observed changes in the muscular thickness are due to the demanded task or to a measuring error (8). It is argued that the transducer should be positioned in a standardized manner and that the radiologist must follow a specific protocole, like the one performed in this study (11, 12). In previous study (6) was suggested that the demand of functional adaptations undergone by individuals with Bell Facial Palsy, might be exceeding the structural and functional tolerance of the TMJs, favoring the development of signals compatible with the Temporomandibular Disorder. Another study (22), in which was performed the assessment of the masseter muscle through magnetic resonance, establishing the index of intensity of the masseter muscle/white substance signal, showed the existence of statistically significant difference between normal individuals and those with Temporomandibular Disorder. The present study did not present results similar to those of the studies quoted above. We believe that the time of facial paralysis of the analyzed patients was not enough to generate the anatomical and physiological differences to the masticator muscles evaluated in relation to the group of normal patients. On literature specialized in the study of cellular alterations that may lead to degeneration and atrophy of the muscular fibers in cases of facial paralysis, it was verified that after approximately 24 months (18, 23, 24) of the alteration/lesion the first signs of atrophy and muscular stiffening should be seen. It is believed that the masticatory muscles would also suffer alterations, in the long run, due to the functional adaptations, once individuals with peripheral facial paralysis have potential conditions that induce to unilateral mastication, performed by the non-affected side, especially because of the difficulty of action of the buccinator muscle (3, 5). The average period of paralysis of the studied patients (6,5 months) and of possible functional adaptations are below the time indicated by previous studies, confirming the raised hypothesis. When the muscle is not used there is a degradation of the contractile proteins, leading to: reduction of number of myofibrils and of the caliber of the fibers - what is called muscular hypertrophy (25) - and, in some cases, eventual substitution of the whole muscle for fat tissue and collagen (18). There may occur cases of immobilization, of some neurologic pathologies, of reduction of the blood supply for long periods, of extended thinness, of malnutrition and particularly denervation, leading to a condition of atrophy, that is characterized by a accentuated hypotrophy (25). Pronounced muscular atrophy will be evident in every individual with involvement of the inferior neurons of the peripheral nerves. Even mild muscular atrophy usually results in some loss of mobility or strength of the muscles. The muscular atrophy often ends up predisposing the patient to muscular unbalance, and may lead to some joint disorders. Intact joints, absence of pain and discomfort and an adequate diet are indispensable factors and of extreme importance for the realization of a safe work in search for balance. Label: LM - Left masseter; RM - Right masseter; PM - Masseter of the paralyzed side; nPM - Masseter of the non-paralyzed side; MIC - Maximum dental intercuspation; CT - Maximum dental intercuspation with cotton rollers. Label: MIC - Máxima dental intercuspation; CT - Maximum dental intercuspation with cotton rollers. Label: RES - Rest; MIC - Máxima dental intercuspation; CT - Maximum dental intercuspation with cotton rollers. Label: RES - Rest; MIC - Máxima dental intercuspation; CT - Maximum dental intercuspation with cotton rollers; Temp - Temporal muscle; Mass - Masseter muscle. Such results demonstrate that in this period of FP there is still no damage to the morphology or the motor control of the masseter and temporal muscles. Thus, it is believed that orientation and guidance of the Stomatognathic Functions should be carried in this individuals, in order to prevent possible functional adaptations that may come to alter the functioning of the TMJs. We suggest that further studies are conducted so that can be defined the time of Facial Paralysis that causes the appearance of functional adaptations and structural modifications in the masticatory muscles and temporomandibular intra-joints components. 1. Goffi-Gomez MVS, Vasconcelos LGE, Bernardes DFF. Intervenção Fonoaudiológica na Paralisia Facial. In: Leslie Piccolotto Ferreira. (Org.). Tratado de Fonoaudiologia. 1 ed. São Paulo: Roca; 2004. p.512-526. 2. Diels HJ. Facial paralysis: is there a role for a therapist? Facial Plast Surg. 2000, 16(4):361-4. 3. Rahal A, Goffi-Gomez MVS. Avaliação eletromiográfica do músculo masseter em pessoas com paralisia facial periférica de longa duração. Rev. CEFAC. 2007, 9(2):207-12. 4. Bernardes DFF, Goffi-Gomez MVS, Bento RF. Eletromiografia de superfície em pacientes portadores de paralisia facial periférica. Rev. CEFAC. 2009, 12(1):91-96. 5. Douglas CR. Fisiologia do ato mastigatório. In: Patofisiologia oral: fisiologia normal e patológica aplicada e odontologia e fonoaudiologia. São Paulo: Pancast; 1998. p.245-72. 6. Sassi FC, Mangilli LD, Poluca MC, Bento RF, Andrade CRF. Amplitude Mandibular em Pacientes com Paralisia Facial Periférica Idiopática. Brazilian journal of otorhinolaryngology (no prelo). 7. Felício CM, Couto GA, Ferreira CLP, et al. Reliability of masticatory efficiency with beads and correlation with the muscle activity. Pró-Fono Revista de Atualização Científica. 2008, 20(4):225-30. 8. Mangilli LD, Sassi FC, Sernik RA, Tanaka C, Andrade CRF de. Avaliação eletromiográfica e ultrassonográfica do músculo masseter em indivíduos normais: estudo piloto. Pró-Fono Revista de Atualização Científica. 2009, 21(3):261-4. 9. Bianchini EMG. Mastigação e ATM: avaliação e terapia. In: Marchesan IQ. Fundamentos em fonoaudiologia: aspectos clínicos da motricidade oral. Rio de Janeiro: Guanabara-Koogan. 1998. p.37-49. 10. Nakata Y, Ueda HM, Kato M, et al. Change in stomatognathic function induced by orthognathic surgery in patients with mandibular prognathism. J Oral Maxillofac Surg. 2007, 65:444-451. 11. Esformes JI, Narici MV, Maganaris CN. Measurement of human muscle volume using ultrasonographic. European Journal of Applied Physiology. 2002, 87:90-92. 12. Emshoff R, Bertram S, Brandlmaier I, et al. Ultrassonographic assessment of local cross-sectional dimension of masseter muscle sites: a reproducible technique? Journal of Oral Rehabilitation. 2002, 29:1059-1062. 13. Benington PCM, Gardener JE, Hunt NP. Masseter muscle volume measured using ultrasonographic and its relationship with facial morphology. Eur J Ortho. 1999, 21:659-670. 14. Bertram S, Brandlmaier I, Rudisch A, et al. Cross-sectional characteristics of the masseter muscle: an ultrasonographic study. Int J Oral Maxillofac Surg. 2003, 32:64-68. 15. Emshoff R, Emshoff I, Rudisch A, et al. Reliability and temporal variation of masseter muscle thickness measurements utilizing ultrasonography. J Oral Rehabil. 2003, 30:1168-1172. 16. Satiroglu F, Arun T, Isik F. Comparative data on facial morphology and musle thickness using ultrasonography. Eur J Ortho. 2005, 27:562-567. 17. Emshoff R, Bertram S, Strobl H. Cross-sectional charactistics of muscle of the head and neck. Oral Surgery, Oral Medicine, Oral Pathology, Oral Radiology, and Endodontics. 1997, 87:93. 18. Toledo PN. Efeito da terapia miofuncional em pacientes com paralisia facial de longa duração associada à aplicação de toxina botulínica. 2007. Tese (Doutorado em Pós-Graduação em Cirurgia Plástica) - Faculdade de Medicina da Universidade de São Paulo. 19. 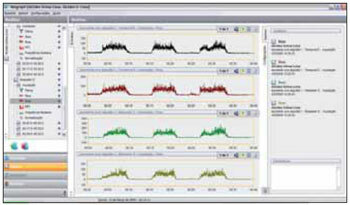 Standards for Reporting EMG data. Journal of Electromyography and Kinesiology. Feb 1999, 9(1):III-IV. 20. Soderberg GL, Cook MT. Electromyography in biomechanics. Phys Ther. 1984, 64(12):1813-20. 21. Sforza C, Peretta R, Grandi G, et al. Soft tissue facial planes and masticatory muscle function in skeletal Class III patients before and after orthognatic surgery treatment. J Oral Maxillofac Surg. 2008, 66:691-698. 22. Nassri LFG, Abdala N, Szejnfeld J, Nassri MRG. Análise comparativa entre os achados de ressonância magnética do músculo facial masseter em indivíduos com e sem disfunção temporomandibular: parte II. Rev Sul-Bras Odontol. 2009, 6(4):401-5. 23. Rubin LR. The anatomy of a smile: its importance in the treatment of facial paralysis. Plast Reconstr Surg. 1974, 53:384-7. 24. Baker DC. Facial paralysis. In: McCarthy JG, editor. Plast surgery. Philadehphia: W.B. Saunders Company; 1990, 3: p.2237-319. 25. Guyton AC, Hall J E. Tratado de Fisiologia Médica. São Paulo: Manole. 2006. 1) Doctor in Science by the Faculty of Medicine of University of São Paulo. Phonoaudiologist of the Department of Physiotherapy, Phonoaudiology and Occupational Therapy of the Faculdty of Medicine of University of São Paulo. 2) Doctorate of the Science Program of Rehabilitation of the Department of Physiotherapy, Phonoaudiology and Occupational Therapy of FMUSP. Phonoaudiologist of the Central Institute of Hospital das Clínicas from the Faculty of Medicine of University of São Paulo. 3) Master's student of the Science Program of Rehabilitation of the Department of Physiotherapy, Phonoaudiology and Occupational Therapy of Faculty of Medicine of University of São Paulo. 4) Doctorate in Otorhinolaringology by Hospital das Clínicas of the Faculty of Medicine of University of São Paulo. Contributor to the Peripheral Facial Paralysis Clinic of Hospital das Clínicas of Faculty of Medicine of University of São Paulo. 5) Professor in charge of the Department of Physiotherapy, Phonoaudiology and Occupational Therapy of Faculty of Medicine of University of São Paulo. Article received on July 1st of 2011. Article approved on July 31st of 2011.